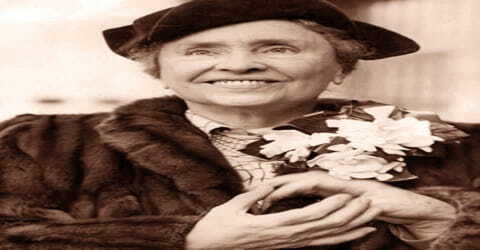 Helen Keller – American author, political activist, and lecturer. Place of Birth: Tuscumbia, Alabama, U.S.
Place of Death: Arcan Ridge, Easton, Connecticut, U.S.
Helen Keller was born on June 27, 1880, in Tuscumbia, Alabama. She was the first deaf-blind person to earn a bachelor of arts degree. There is possibly no one on this earth who has never heard of her name even for once in their life. Keller was the first deaf and blind woman who had created waves as a writer, political activist, and lecturer. She is regarded as an extremely powerful example of dynamism and advocacy for people with disabilities. 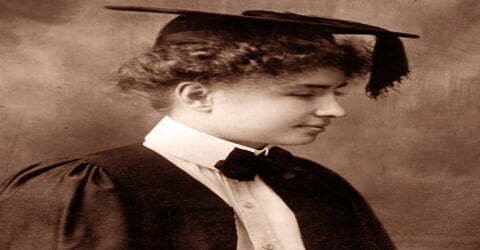 Beginning in 1887, Keller’s teacher, Anne Sullivan, helped her make tremendous progress with her ability to communicate, and Keller went on to college, graduating in 1904. In 1920, Keller helped found the ACLU. During her lifetime, she received many honors in recognition of her accomplishments. Keller is remembered for her autobiography ‘The Story of My Life’ and other brilliant essay compilations like ‘Out of the Dark’. Keller had written various books and essays on socialist and spiritual topics. Generations after generations have known Keller so well through various film, television series, and documentary adaptations produced, depicting the story of her life. Keller had been the guiding light of the American Foundation for the Blind for which she had raised funds. Keller had won many posthumous honors like being named in hospitals and physically challenged foundations. A prolific author, Keller was well-traveled and outspoken in her convictions. A member of the Socialist Party of America and the Industrial Workers of the World, she campaigned for women’s suffrage, labor rights, socialism, antimilitarism, and other similar causes. She was inducted into the Alabama Women’s Hall of Fame in 1971 and was one of twelve inaugural inductees to the Alabama Writers Hall of Fame on June 8, 2015. Helen Adams Keller was born in Tuscumbia, Alabama, on June 27, 1880. Her family lived on a homestead, Ivy Green, that Helen’s grandfather had built decades earlier. Her parents were Captain Arthur H. Keller and Katherine Adams Keller. She had four siblings; two full siblings, Mildred Campbell (Keller) Tyson and Phillip Brooks Keller, and two older half-brothers from her father’s prior marriage, James McDonald Keller and William Simpson Keller. Her father was a veteran of the confederate army (an army that fought to separate from the United States during the Civil War, which lasted from 1861 to 1865). He also was the editor of the local newspaper, the North Alabamian. As a child, Helen could only communicate with Martha Washington who was Helen’s family cook’s daughter. Martha understood much of Helen’s signs. Helen used 60 of her home signs while communicating with her family. In 1886 Helen was sent by her mother while being accompanied by her father to seek the help of Dr. J. Julian Chisolm, an eye, ear, nose, and throat specialist in Baltimore, for advice. This was the first time that Helen was sent for a professional learning process and her mother had taken this step after getting inspired by inspired by an account in Charles Dickens’ “American Notes” of the successful education of another deaf and blind woman, Laura Bridgman. Dr. J. Julian Chisolm referred Helen and her father to Alexander Graham Bell, who was then working with deaf children at the time. Bell further made Helen and her family go to Perkins Institute for the Blind where Laura Bridgman had received her formal education. Helen had found her instructor in Perkins’ former student Anne Sullivan (who was visually impaired for 20 years) who was personally referred by Michael Anaganos, Perkins’ director. It was the beginning of a 49-year-long relationship during which Sullivan evolved into Keller’s governess and eventually her companion. 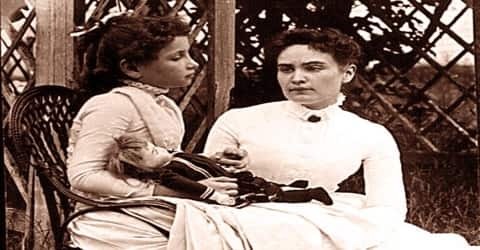 Anne Sullivan was with Helen day and night, constantly spelling into her hand the words and ideas of things going on around them. Helen was a quick learner. In only three years she learned the manual alphabet (sign language), the Braille alphabet (an alphabet created by Louis Braille (1809–1852) for the blind that relies on raised dots to communicate), and she could read and write. In May 1888, Keller started attending the Perkins Institute for the Blind. In 1894, Keller and Sullivan moved to New York to attend the Wright-Humason School for the Deaf, and to learn from Sarah Fuller at the Horace Mann School for the Deaf. In 1896, they returned to Massachusetts, and Keller entered The Cambridge School for Young Ladies before gaining admittance, in 1900, to Radcliffe College of Harvard University where she lived in Briggs Hall, South House. Her admirer, Mark Twain, had introduced her to Standard Oil magnate Henry Huttleston Rogers, who, with his wife Abbie, paid for her education. In 1904, at the age of 24, Keller graduated from Radcliffe, becoming the first deaf-blind person to earn a Bachelor of Arts degree. She maintained a correspondence with the Austrian philosopher and pedagogue Wilhelm Jerusalem, who was one of the first to discover her literary talent. This was all done with the assistance of Anne Sullivan interpreting the lectures and texts. Determined to communicate with others as conventionally as possible, Keller learned to speak and spent much of her life giving speeches and lectures on aspects of her life. She learned to “hear” people’s speech by reading their lips with her hands her sense of touch had heightened. She became proficient at using braille and reading sign language with her hands as well. Shortly before World War I, with the assistance of the Zoellner Quartet, she determined that by placing her fingertips on a resonant tabletop she could experience music played close by. Keller and Thomson moved to Connecticut. They traveled worldwide and raised funds for the blind. Thomson had a stroke in 1957 from which she never fully recovered, and died in 1960. Winnie Corbally, a nurse whom they originally hired to care for Thomson in 1957, stayed on after her death and was Keller’s companion for the rest of her life. As a young woman, Keller became determined to learn about the world and to improve the lives of others. With insight, energy, and deep devotion to humanity, she lectured throughout the world, worked to forward her ideas in Congress, and wrote thousands of letters asking for contributions to finance efforts to improve the welfare of the blind. She visited hospitals and helped blind soldiers. She taught the blind to be courageous and to make their lives rich, productive, and beautiful for others and for themselves. 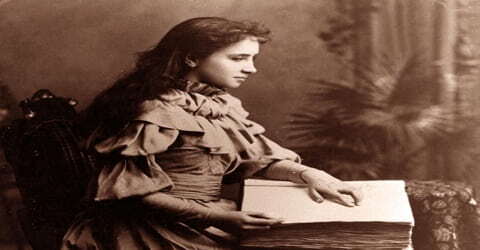 Helen Keller became a world-renowned writer and a magnificent orator. She is remembered even today for her tremendous efforts and contributions in advocating the cause of people with disabilities and many other social causes. Helen was outright in rejecting Woodrow Wilson’s policies as she was a notable radical socialist. 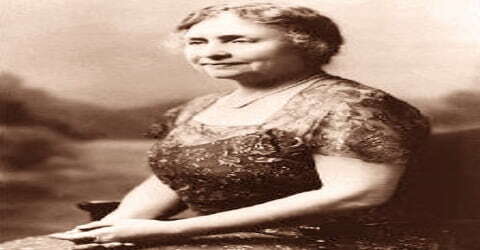 Helen played an integral role in promoting birth control, suffrage and was a pacifist in ideas. She was a socialist and believed in radical changes than parliamentary socialism which according to her was “sinking in the political bog”. In 1912 Keller joined the Industrial Workers of the World (known as the IWW or the Wobblies). With the help of Sullivan and Sullivan’s future husband, John Macy, Keller wrote her first book, The Story of My Life. It covered her transformation from childhood to 21-year-old college student. In 1905, Sullivan married John Macy, an instructor at Harvard University, a social critic and a prominent socialist. After the marriage, Sullivan continued to be Keller’s guide and mentor. When Keller went to live with the Macys, they both initially gave Keller their undivided attention. Gradually, however, Anne and John became distant to each other, as Anne’s devotion to Keller continued unabated. After several years, they separated, though were never divorced. In 1915 she found the Helen Keller International (HKI) organization along with George Kessler which devoted its work and research in the areas of vision, health, and nutrition. In 1920 Helen greatly helped founding the American Civil Liberties Union (ACLU). Keller was accompanied by Sullivan in 39 foreign country trips. Together Helen and Sullivan visited Japan where Helen became a favorite of the Japanese people. During her travels and political visits, Keller met several American Presidents from Grover Cleveland to Lyndon B. Johnson and became friends with many famous individuals like Alexander Graham Bell, Charlie Chaplin, and Mark Twain. Helen Keller was greatly interested in activism because of her extreme concern for blindness and other disabilities. She regularly wrote for IWW from 1916 to 1918. She stated in one of her writings on social activism, “I was appointed on a commission to investigate the conditions of the blind. For the first time I, who had thought blindness a misfortune beyond human control, found that too much of it was traceable to wrong industrial conditions, often caused by the selfishness and greed of employers. And the social evil contributed its share. I found that poverty drove women to a life of shame that ended in blindness”. In 1948 she went to New Zealand and visited Deaf schools in Christchurch and Auckland. She met Deaf Society of Canterbury Life Member Patty Still in Christchurch. During her lifetime, she received many honors in recognition of her accomplishments, including the Theodore Roosevelt Distinguished Service Medal in 1936, the Presidential Medal of Freedom in 1964, and election to the Women’s Hall of Fame in 1965. In 1973, Helen Keller was inducted into the National Women’s Hall of Fame. A stamp was issued in 1980 by the United States Postal Service depicting Keller and Sullivan, to mark the centennial of Keller’s birth. She also received honorary doctoral degrees from Temple University and Harvard University and from the universities of Glasgow, Scotland; Berlin, Germany; Delhi, India; and Witwatersrand in Johannesburg, South Africa. Additionally, she was named an Honorary Fellow of the Educational Institute of Scotland. Keller suffered a series of strokes in 1961 and spent the remaining years of her life at her home in Connecticut. Keller died in her sleep on 1 June 1968 at her home, Arcan Ridge located in Easton, Connecticut. In 1965 she was elected to the National Women’s Hall of Fame at the New York World’s Fair. Keller devoted much of her later life to raising funds for the American Foundation for the Blind. 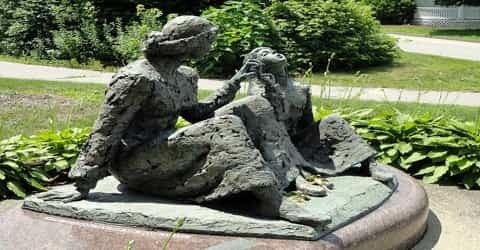 She died in her sleep on June 1, 1968, at her home, Arcan Ridge, located in Easton, Connecticut, a few weeks short of her eighty-eighth birthday. A service was held in her honor at the National Cathedral in Washington, D.C., her body was cremated and her ashes were placed there next to her constant companions, Anne Sullivan and Polly Thomson. She was buried at the Washington National Cathedral in Washington, D.C.
Helen Keller associated with some of the greatest people of her time, including Alexander Graham Bell, Mark Twain (1835–1910), Andrew Carnegie (1835–1919), John D. Rockefeller Sr. (1839–1937), and Presidents Grover Cleveland (1838–1908), Calvin Coolidge (1872–1933), and Woodrow Wilson (1856–1924). 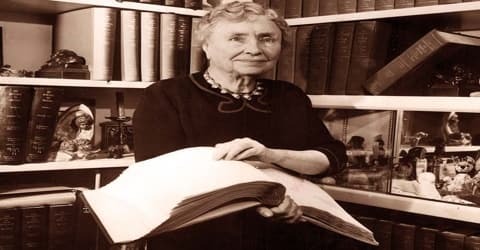 She authored such books as Helen Keller’s Journal, Out of the Dark, Midstream: My Later Life, My Religion, The Song of the Stone Wall, The World I Live In, and The Story of My Life. Sullivan served as Keller’s counselor and companion. When Keller died in 1968 her name had become a worldwide symbol of what the human spirit can accomplish despite severe physical limitations. In 1999 Keller’s name got listed into Gallup’s Most Widely Admired People of the 20th Century. Keller lends her name to the Helen Keller Hospital in Sheffield, Alabama which was dedicated to her. In 2003, Alabama honored Helen, who was considered as Alabama’s native daughter, on its “state quarter”. There are streets in Getafe, Spain and Lod, Israel which have been named after Helen Keller. On October 7, 2009, a bronze statue of Helen Keller was added to the National Statuary Hall Collection.